Are you wasting 8 and 1/2 hours a week figuring out what you were doing moments before? Email have very quickly become one of more useful tools of our everyday lives. In the office, the omnipresent inbox is constantly beeping and teaming with new messages. The presence of email is hard to ignore. When a new incoming message appears it’s quite difficult not to take a peek at what just popped up in out inbox. The human nature is an inquisitive one and I find it impossible to simply ignore it. According to an interesting research published in the Sydney Morning Herald Email is actually becoming a dangerous distraction. Apparently email is costing companies millions. The Sydney Morning Herald quotes a study by Dr Thomas Jackson of Loughborough University, England. In this study Dr Jackson found that it takes an average of 64 seconds to recover your train of thought after interruption by email. So people who check their email every five minutes waste 8 and 1/2 hours a week figuring out what they were doing moments before. People tend to respond to email as it arrives, taking an average of only one minute and 44 seconds to act upon a new email notification; 70% of alerts got a reaction within six seconds. A July 2006 study by ClearContext, an email management tools vendor, surveyed 250 users and discovered that 56% spent more than two hours a day in their inbox. By January 2008, 38% of respondents received more than 100 emails a day – and that it stopped them from doing other things. Email is very easy to operate, immediate, time efficient and free. As a result emails have become the preferred method of communication in business and private life. Waste in emails is abundant. This is of course the case with any resource which is readily available and costs nothing. This doesn’t mean you can’t change that for both yourself and your organization. The advantages of emails significantly outweigh the disadvantages but with an extra effort emails can be really harnessed to empower your time management. Imagine the following situation: You arrive at the office and read your mail, reply to most of it and save a couple emails for later reference. During the day incoming mail constantly distracts you from your work with replies on replies, new emails or follow-ups. You browse through a couple, reply if it’s quick and mark the rest as unread so you won’t forget to re-read it when you have the time. Jumping at any incoming email is a complete waste of time. You are distracted from your work; you don’t really focus that incoming email and you’ll just have to read it again later when you have the time. My advice is to process emails in batches. Make a habit of reading emails early in the morning when the day has yet to start. Read each email thoroughly and act on it on the same moment (forward, sort, translate to a task etc.). Let incoming email accumulate and process those the next morning. Meanwhile your colleagues have had the chance to reply properly and maybe do something about it. It is tempting to take a peek in incoming emails but remember you’ll probably just mark them as unread for later reference and waste precious time. Emails are mostly used for communication of information or tasks which have a lifespan of over a couple of days. Use that characteristic to your advantage. 4. Always consider whether email is the right form of communication – Emails have become so popular that many people use them for all communication sorts. From deciding on lunch to small talk. This is of course an utter and complete waste of time. Many times talking on the phone or face to face is faster, more efficient and does not create havoc in your inbox. Emails are often the retreat of less assertive people trying to assert themselves. Confronting them either on the phone or face to face may help you put an end to problems before they’re born. a. Share their work (see, I’m working). b. Share the responsibility (I’ve updated you on that). You can put an end to it. First, create a rule which moves emails where you are CC’ied to another folder. When you have the time, stop and read those. You’ll be surprised why you insisted on reading those at the first place. Second, try and change that in your close surroundings. Comment people who include you in irrelevant email conversations. CC’s are one of the major waste multipliers in emails as they easily spread. 6. Email only to the relevant people – The other side of tip #5. By including only the relevant people in your email conversations you’re reducing the potential number of replies and you’re also keeping the replies practical and to the point. 8. Use rules to sort out emails by “friendly” spammers – “Friendly” spammers exist in every organization. Starting from human resources to other colleagues which insist on sending birthdays, jokes and who knows what. Conveniently create rules to send emails from these sources to specific folders and browse through them when you’re bored (or never …). 9. Actually, avoid it altogether if you can – Get yourself removed from as many lists and groups as possible. This will eventually reduce your incoming emails by amazing percents. Important information has its ways to find you. 10. Use flags and colors to manage email follow-up – Email applications offer many tools for sorting and follow-up. Tools such as colors and flags by topics are very helpful to keep efficient follow-up. It is very important not to misuse these tools to mark email which need to be read again later (we’ve discussed that already). Use these tools only to follow-up and sort emails which you’ve already acted on. 11. If you’re replying to similar emails create templates – If you’re constantly replying similar content use ready templates to save on typing and phrasing. 12. Use predefined groups – If you have to (and I mean have to) email the masses often use predefined mailing lists. Save time on redundant search and don’t risk forgetting someone. 13. Keep answers short and to the point – Keep you’re emails practical, short and on topic. Use short and clear topics and content. This will help keeping replies as practical and save you time on dealing with other issues which do not interest you. 14. Use Google desktop for efficient and effective search – Most email application lack good search tools. Google Desktop is great in finding those hard to find emails and saves precious time on search and continued browsing in all those sub-folders. 15. 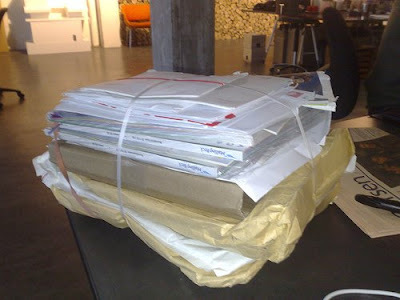 Sort emails regularly into sub-folders – A regular part of acting on emails is to sort them to relevant sub-folders. Keep your inbox (and sent items) nice and clean. Sub-folders are very helpful in creating order in the chaos. Implementing several of the aforementioned tips and advice at once creates synergies which will benefit you and your organization even more. As with any change constant implementation and monitoring is required. Self discipline is called for. Fight you habits and rip the rewards. « Shortcuts to Early Retirement – Absurd Frugal Thinking or Common Financial Sense?